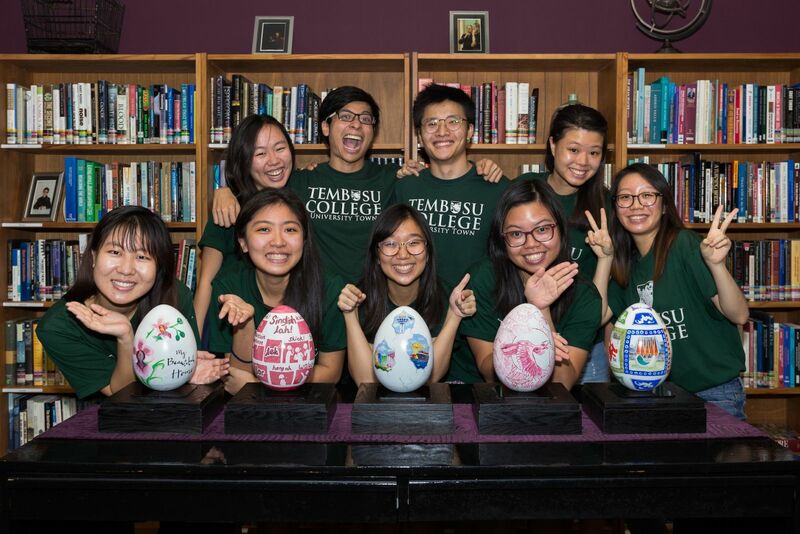 Tembusu College, through our Rector Professor Tommy Koh, received 5 Easter eggs that were to be painted to benefit Very Special Arts Singapore (VSA) — a charity with the mission to provide people with disabilities the opportunity to access the arts for rehabilitation and social integration. 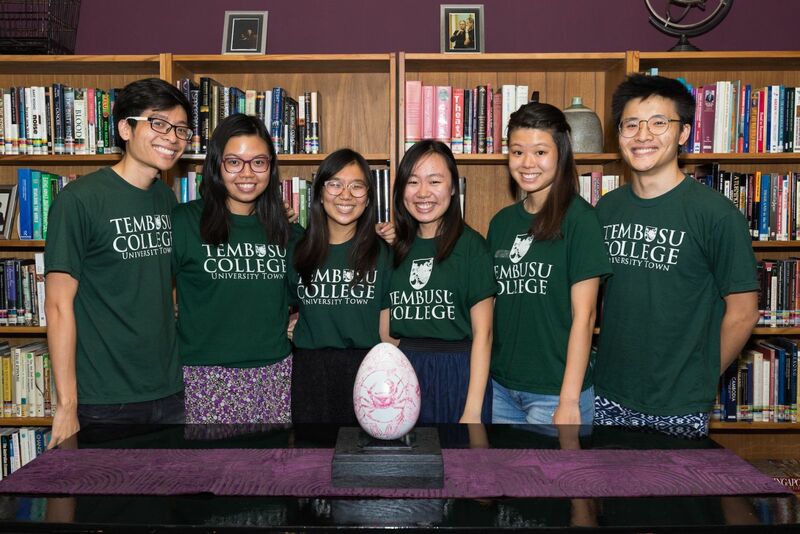 Nine Tembusu students, led by Dr Margaret Tan, worked diligently over two weeks, in between their mid-term examinations no less, to complete the eggs for this worthy cause. 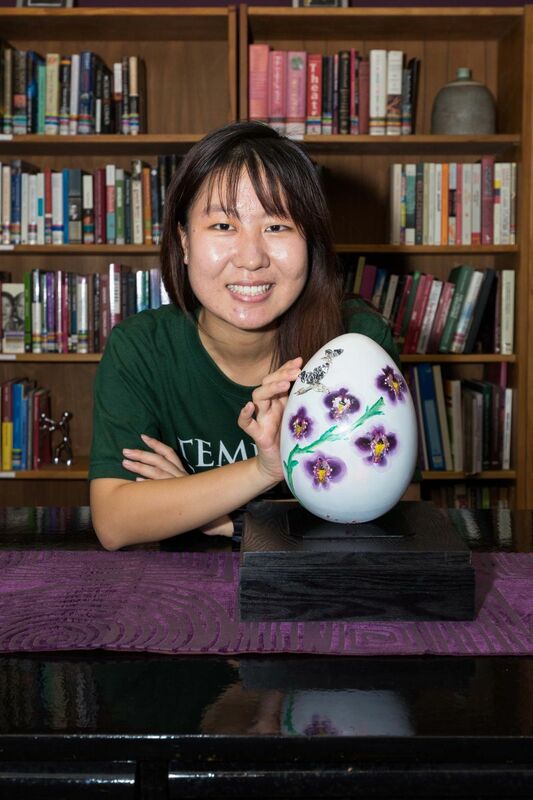 Each egg, measuring 160mm by 200mm, was initially placed online for auction — with a starting bid of S$1000. The final bid was confirmed at The Easter Auction and Charity Gala Dinner on Sat, 18thApril 2015, at the S.E.A. Aquarium, Resort World Sentosa. Professor Koh, who is the Patron of VSA, was the Guest-of-Honour for the Gala Dinner. 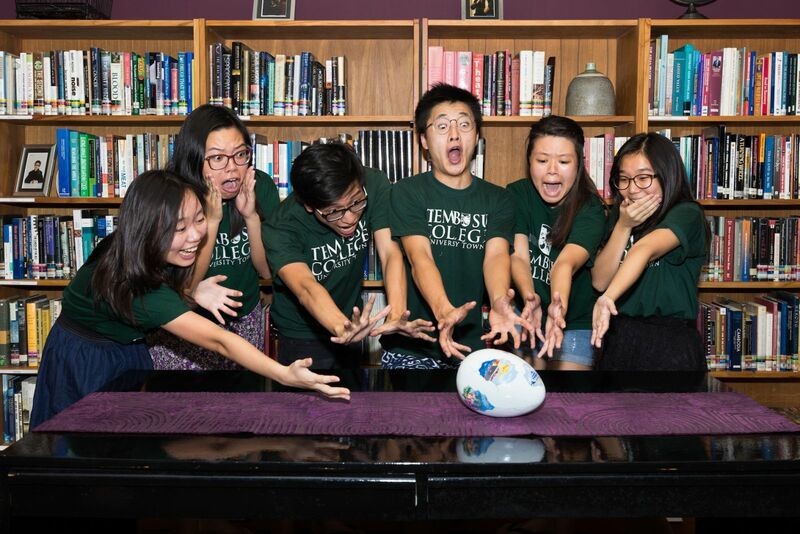 All the eggs painted by the students were auctioned off and the event raised a total of S$221,042 for VSA. Singlish is a distinctive language that any Singaporean would be able to relate and connect with. This design provides a literal and fun guide to this peculiar expression. As we commemorate 50 years of development, let us also celebrate this unique part of our Singaporean identity! Melissa Lim Jia Ying is an undergraduate majoring in Sociology at the National University of Singapore who spends most of her time in lectures doodling. She draws inspiration from cartoons and comics and believes that one can never be too old for such things. She also founded a little drawing interest group in Tembusu College that focuses on illustration and painting. Despite Singapore’s progress, we must reflect on everyday things that constitute our shared memories. These shared experiences are what bind us as a nation emotionally and psychologically. The images painted here were places of interaction and laden with strong social and cultural values. I have also added my well wishes for Singapore throughthe Chinese motifs of the bat, Qilin, magpie, and rooster, signifying prosperity, happiness, and auspiciousness. Tang Xiaow Jun is currently a student of Tembusu College, majoring in Communications and New Media in NUS. She is very passionate about visual arts and is particularly interested in Japanese art and aesthetics, such as Wabi Sabi and Manga. In her free time, Xiaow Jun enjoys making art and viewing art exhibitions. She also volunteers with the Animal Concerns Research and Education Society (ACRES) because she is very fond of reptiles, especially tortoises and terrapins. Xiaow Jun dreams of working with National Geographic in the future as a photojournalist. This egg is dedicated to our pioneer generation who helped make Singapore our beautiful home. The five orchids signify Singapore’s 50 years of independence and the young buds, her potential to continue shining on the global stage. The silver butterflies represent our pioneer generation and the crucial role they play in making the flowers blossom. Zhao Yi Ling is second year statistics student at NUS, living in Tembusu College, with a love for arts and nature. She likes to sketch and paint in her free time, drawing inspiration from nature and architecture. Recently involved in the SG50 exhibition "Local Champions, Global Leaders", she hopes to discover the many facets to Singapore’s vibrant cityscape and make a meaningful contribution to the nation. The flora and fauna depicted on the egg feature six species native to Singapore. While the flora (Vanda Miss Joaqium, Simpoh Air, and Senduduk) are rather ubiquitous in Singapore, the fauna (Oriental Pied Hornbill, Banded Leaf Monkey and the Singapore Freshwater Crab) face the threat of extinction. The egg’s fragility symbolises their current precarious position as a result of the rapid urbanization in Singapore. We hope that our work raises awareness for the conservation of such precious species, lest they become extinct like the Dodo birds. What goes on beyond the face of Singapore? The cracks offer glimpses of common impressions of Singapore. However, there is more beneath the surface that these superficial impressions cannot encapsulate. As we celebrate our golden jubilee, it is timely for us to pause and reflect on what defines our nation. Pang Guet Ghee is a rather ordinary student who studies Sociology and lives at Tembusu College. Creating art is her way of trying to pay homage to little pieces of beauty, making them her own in the process. She enjoys drawing and painting people especially, but typography has also crept into her field of interests. She thinks that making art is a lot about patience and persistence. Mary Anne Ho is a 2nd-Year English Literature major living at Tembusu College, NUS, who deeply respects the need for the cultural articulation of feelings and memories. In her free time, she enjoys putting moments into words and finding self-expression in poetry. She believes in the power of a growing arts scene in Singapore to bring self-expression and stable identity to this young nation and its people. 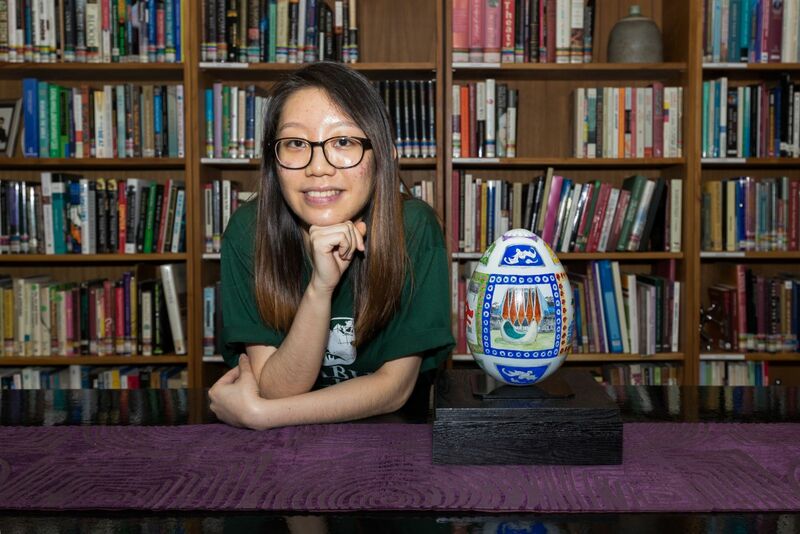 Whether it is poetry or egg painting, she thinks everyone can find themselves through art. Liew Yuqi was born in Singapore circa 1992. Since existence immemorial, he has been doing arts and crafts at his leisure, spending quality time with Mum, and somewhere in his heart he regrets not continuing to pursue Art as part of secondary school. He could have been elsewhere by now, but currently he is half-way through his Architecture degree at National University of Singapore. Having been involved in an SG50 exhibition, Local Champions Global Leaders, prior to this, he is glad that he is still able to find time to be part of another SG50 celebratory project and represent Tembusu College in this worthy cause. Lim Jia Ying is a Life Sciences major at NUS enthralled by the wonders of nature and gets inevitably excited about her avian friends wherever she goes. She thinks the biodiversity in Singapore is very much worth exploring indeed, and hopes to inspire enthusiasm for it amongst the younger generation in the near future. Apart from that, she believes in the accessibility of art to all, and is pleased to be helming an arts and crafts interest group, Yarn & Glue, in Tembusu College. Jerrell Seah has a serious case of wanderlust and is very interested in exploring new countries and meeting new people. As a Chemical Engineering student at NUS, he is schooled in the sciences and its applications. In his free time, Jerrell enjoys reading, listening to music and learning languages. His latest interest is exploring his creative side through the arts and craft interest group, Yarn & Glue, in Tembusu College. To be able to contribute to the Easter Egg project was a great and meaningful experience for him and he looks forward to future events! 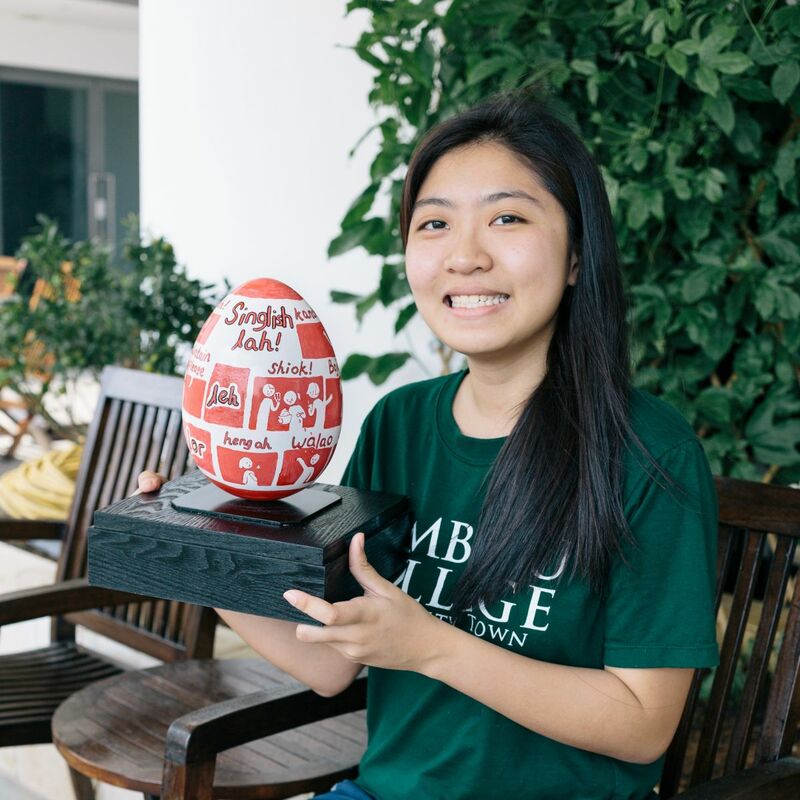 Dawn Seow is an avid crafter at Tembusu College who finds herself spending all the free time she has scrapbooking, painting, and doing calligraphy. It brings her great joy to spread the love for arts and crafts to others; she takes delight in seeing others enjoy doing what she loves. Currently pursuing a degree in Psychology and Social Work at NUS, she holds a strong conviction in making a positive impact on the community and hopes to work closely with children and youths in the future.